Late evening, two days ago, and a family member comes in from the backyard to report a strange sighting on the steps leading to the garden. I take a look, and am startled by the size of the insect-like thing suspended on the face of the steps. 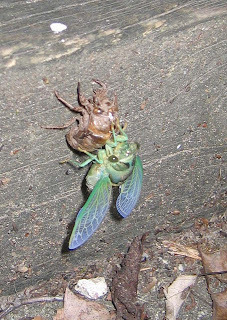 Closer inspection revealed a cicada of unknown species doing a slow-mo back flip out of its terrestrial skin, with little proto-wing stubs on either side. Half an hour later, it has righted itself and succeeded in pumping blood into its wings, which are now air drying. The suspension is critical, because if the unfolding wings touch anything, they will be distorted and the little beastie will not be able to launch into the flying stage of its life. I was struck by the beauty, speed and ingenuity of this transformation to airworthy status. Another cicada pulled off the same timeless stunt two steps away, and the next day the drone of cicadas was noticeably stronger. But life for the newly hatched cicadas is not entirely a carefree singfest in the trees. Nature has its checks and balances, as I found out the next day when I visited the rainwater garden on Harrison Street a couple blocks away. There, a strange and even more massive insect-like thing flew low to the ground, landing on a tree trunk. Part of it turned out to be a cicada, the other part a Cicada Killer wasp, which had paralyzed the cicada with its sting and was now struggling to transport it. I watched as the wasp dragged the cicada up the tree trunk to a comfortable perch, presumably to munch upon this juicy morsel. An internet search revealed that the mature wasp feeds on pollen and nectar, not cicadas, and was instead dragging it up the tree so that it could then glide with it to the wasp's underground burrow, there to lay an egg in the paralyzed cicada. 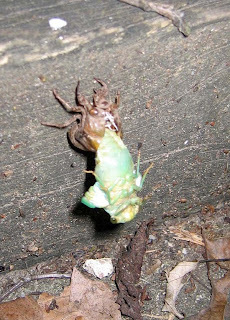 The egg will then hatch and the larval wasp will eat the well-preserved cicada's insides. Meanwhile, passing motorists see only the benign facade of flowers, if they see anything at all. Nature's workings are all the more hidden when they happen along a busy street, where people are so intent on getting somewhere else that they don't look left or right. Nature walks, open to the public, are planned for the first four Sundays in August, to inventory plant life in Princeton's parks and preserves. 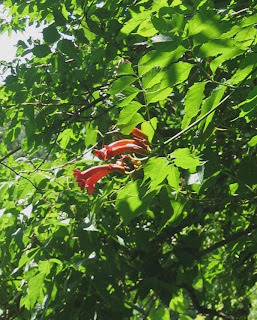 This coming Sunday, August 3, there will be a plant inventory walk at Herrontown Woods. Meet at the parking lot, across Snowden Lane from Smoyer Park, at 2pm. Unlike most of Princeton's preserves, Herrontown Woods is county owned. It features mature forest, boulder fields and also an old farmstead--two houses and a barn--intended by the donor originally to become an environmental center. On August 10, also at 2pm, we'll meet at the Turning Basin Park (on Alexander where it crosses the canal), to inventory plants along the D&R Canal State Park. 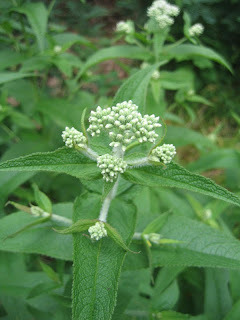 Many showy wildflowers, such as cutleaf coneflower and Hibiscus, begin blooming along the canal towpath in early August. Inventory walks for August 17 and 24 to be announced. 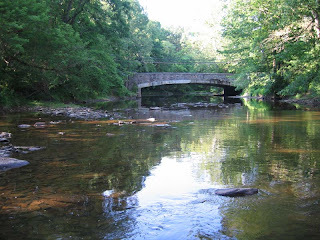 One of my favorites spots to wade out into the riffles of the Stonybrook is just below the Rosedale Road bridge, next to Greenway Meadows park. 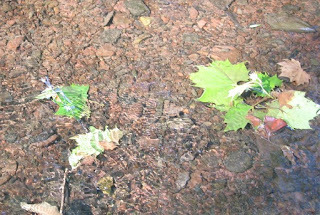 The water's shallow, the bottom stony, and on this particular day in early June, sycamore seeds speckled the water's surface, and a few stray sycamore leaves came drifting downstream, catching occasionally on rocks. 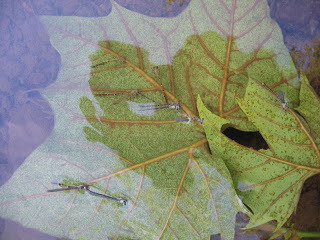 A closer look at the leaves (3rd photo) showed them to be a favored place of congregation for a species of damselfly so intent on procreation that they cared little if they were above or below water. 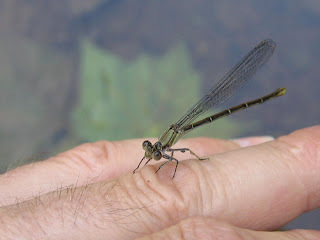 Damselflies clasp their wings together above them when they perch. 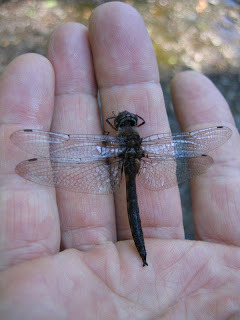 A dragonfly (wings lie flat when at rest, and much stockier--last photo) was not so happy in the water, and had to be rescued from its floundering. The FOPOS summer intern and I saw a pair of pileated woodpeckers at Mountain Lakes Preserve yesterday, flying low to the ground from tree to tree, lingering nowhere for long. These is the largest woodpecker species in the eastern U.S., unless one believes that the ivory billed woodpecker still lives in remote forests of the south. This is my second sighting of a pair of these impressive birds at Mountain Lakes in four years. Lots of new openings in town. 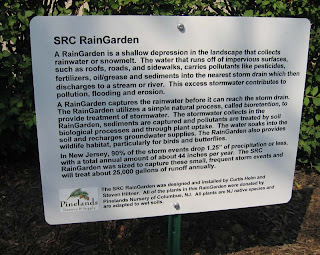 All of these work well in wetland gardens, or regular gardens for that matter, and are being grown in planted wetlands, such as the Princeton High School Ecolab. 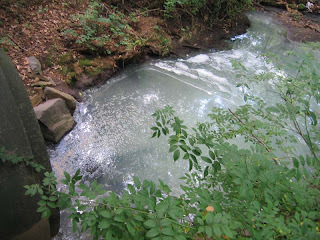 Occasionally, the water in creeks flowing into Pettoranello Gardens from town shows clear signs of pollution. A couple times, the creek feeding Pettoranello Pond from Valley Road has turned an ashen grey. 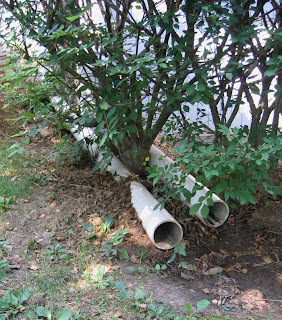 On July 20th, another pipe that empties into the Gardens from under the Community Park fields was obviously carrying something that had been dumped in. It would be interesting to know what streets and businesses feed into these creeks. This particular pipe may drain the Leigh/Birch neighborhood. 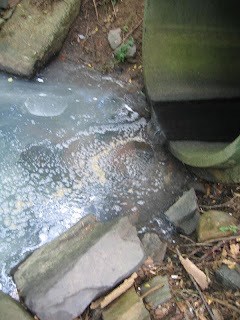 I reported the incident immediately to the police, though I've since been told that Randy Carter at the Princeton Health Department is the one to contact about any sightings of water pollution. In this case, he took a look and found discoloration but no evidence of toxicity. 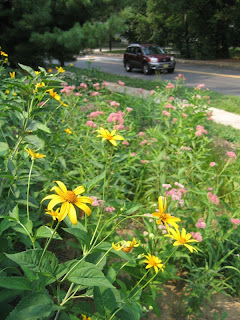 The raingarden planted at Princeton Borough's Senior Center along Harrison Street, just up from Hamilton St, is flourishing. The many wildflowers are just about to cut loose with colorful blooms. It was dug by hand, with help from an old rototiller, and planted with native wildflowers and shrubs. The garden captures runoff directed to it from the downspouts of nearby buildings. Rainwater accumulates to five inches or so in the garden, then seeps into the soil, feeding the plantings. Click on the sign to enlarge it. Borough resident Curtis Helm provided the idea and the initiative, with some assistance at various points from me. Pinelands Nursery contributed the plants. 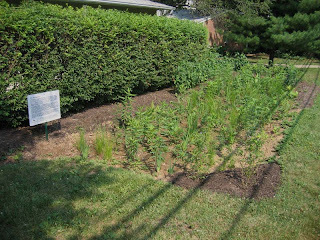 The borough provided mulch to suppress weeds around the edges. 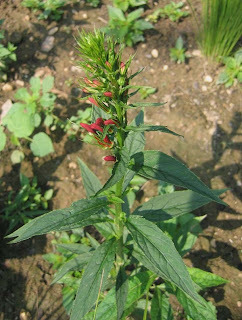 Here is a cardinal flower (Lobelia cardinalis), with bright red blooms about to open. Last Sunday's plant inventory walk included some pleasant surprises. Tusculum has 35 some acres of meadows and forest purchased for preservation this year. The plant inventory will be part of the management plan being prepared for the property. 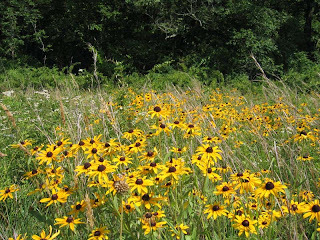 The fields have great potential as habitat for prairie wildflowers. Some are already there. 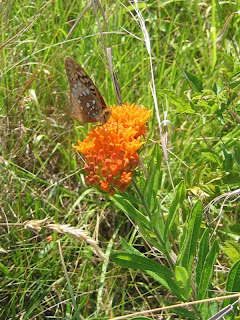 The first photo shows butterflyweed, living up to its name. 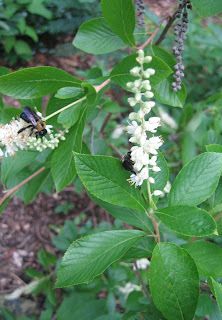 The flower was also attracting lots of tiny green bees during our visit, which reminded me of a NY Times article about the many kinds of native bees, and how various of them have evolved to favor particular flower shapes. Particularly suggestive of these fields' potential for dramatic wildflower displays was this gathering of black-eyed susans, with narrow-leaved mountain mint in the background (white). The insect activity in this patch was tremendous. 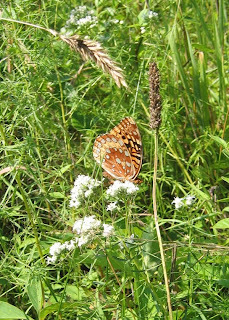 Mountain mint, common in the fields, also attracts butterflies. 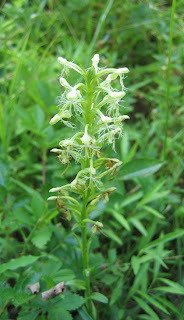 One plant that sent me scrambling for my plant book was this ragged fringed orchis, of which only two were found. Another fairly rare plant found at Tusculum is green milkweed (not shown). An environmental resource inventory (ERI) compiles as much information as possible about a town's natural and historical resources. The document is useful for making planning decisions, and also can tell you things like what watershed you live in, what type of soil you have, what parts of town have been protected from development, what rare species have been found in town, where your drinking water comes from, and where your stormwater goes. Princeton hadn't had its ERI updated since 1978, and had long since lost its usefulness. To hire a consultant to provide a much needed update, the Princeton Environmental Commission (PEC) applied for and got a grant from ANJEC (Association of NJ Environmental Commissions), which was then matched by money from the township and borough. The consultant, the Delaware Valley Regional Planning Commission, with input from the PEC, municipal staff and others, has just finished a 2nd DRAFT. The public also has an opportunity to provide input. You are encouraged to take a look at it and offer comments and suggestions. The document, with lots of colorful maps, can be downloaded from the township website at http://www.princetontwp.org/Princeton_ERI_Draft_7-2.pdf. Not included in the DRAFT document as yet are actual inventories of plants and animals. These are an optional element in ERIs, and happen only if people locally take the initiative to create them. Through my work with Friends of Princeton Open Space, I'm leading walks on Sunday afternoons through various preserves, identifying as many plants as possible. There is also an effort to seek out any existing biological inventories and include them in the publication. If you're interested in joining this effort, and aren't on the email list, please contact me through this website. This Sunday, July 6, I thought it would be fun to do a plant inventory at Princeton Battlefield, where an 18th century encampment will be in place for the weekend (http://www.saveprincetonbattlefield.org/newsEvents/1783/index.php). We'll meet at 2pm, and work the fringes, away from the encampment. We may also head down into the nearby Institute Woods, time permitting. Park in the lot or along Mercer, and meet between Clark House and the barn, close to where the remains of the famed Mercer Oak lie moldering in the woods. This weekly series of plant inventories is being sponsored by Friends of Princeton Open Space. The inventories will be compiled and published in the Princeton Environmental Resource Inventory later this year. 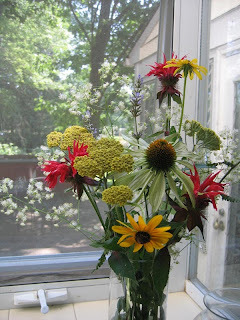 Here's a way to learn native wildflowers, which my wife brought in from the backyard. In the middle is a white version of purple coneflower. The red is beebalm. 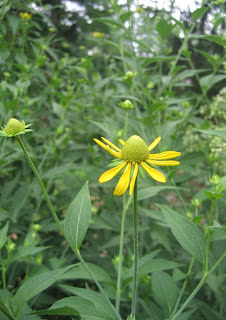 The deep yellow are black-eyed susans (Rudbeckia hirta); the cloud of white flowers in the background are meadow rue. Non-natives joining in are the light yellow disks of an ornamental variety of yarrow, and one blue lavender at the top. One Princeton preserve I get to help take care of is the marsh at Rogers Refuge, which lies between the Institute Woods and the Stony Brook. 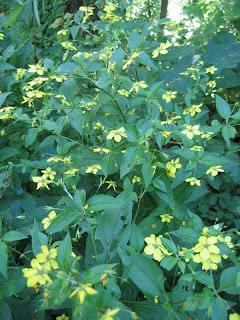 The first photo shows fringed loosestrife, a native with shy flowers that, like mayapple, face downward. 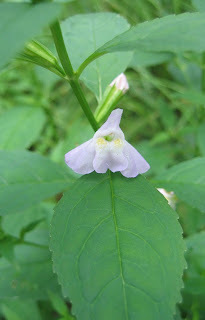 Most people associate the word "loosestrife" with purple loosestrife, an invasive exotic found in marshes and along streambanks, but the native loosestrife shows up in small patches here and there in Princeton preserves. 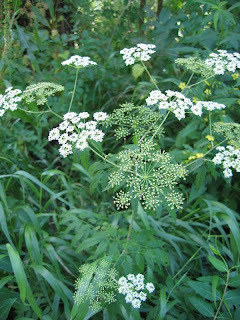 The second photo is of water hemlock, another native wildflower of wet areas. More common is the native trumpet vine, growing on a tree not far from the observation tower that looks out over the marsh at the Refuge. To get there, follow West Drive off of Alexander Road, stay left, and park in the lot just before you reach the water company buildings. The land is owned by the water company, but has a protective easement agreement with Princeton Township. Members of the Friends of Rogers Refuge (FORR) were responsible for helping preserve the marsh back in the 60s, and continue to provide impetus to manage its unique habitat. 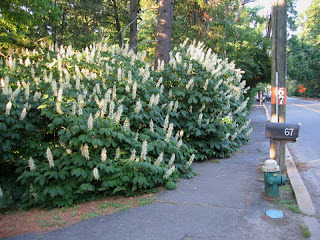 One of my favorite sights in Princeton this time of year is a planting of bottlebrush buckeye out on Rosedale Road on the way to Greenway Meadows Park. 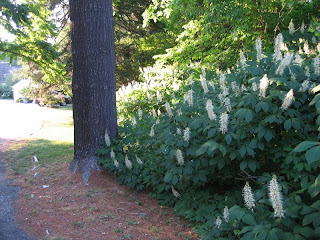 Aesculus parviflora is the latin name, and the USDA plant website shows its native range to be South Carolina, Georgia and Alabama, with a mysterious, disjunct presence also in Pennsylvania and New Jersey. 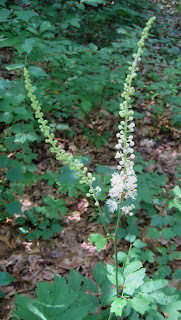 I first encountered it in the native plant section of Duke Gardens, where it has grown into a broad clone on a hillside. I've seen it more recently in Central Park, and planted occasionally in gardens. Never, though, in the wild. The second photo shows its classic shape, as it spreads outward much like sumac. Five of us gathered on Sunday, June 29 to take what was for most of us our first look at this quiet preserve on the east side of Princeton. The goal was to try out the trails and identify as many plants along the way as possible, as part of an effort to document plant diversity in Princeton. The township website descriptions says "the occasional drone of single-engine airplanes adds to the lazy feeling of the place", and sure enough, a plane or two flew over in lazy fashion. The 72 acres vary considerably in the presence of invasive species. 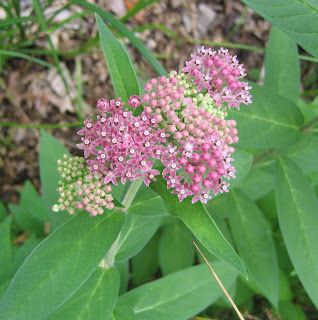 The first stretch has very few exotics, with a nice variety of natives like maple-leaved Viburnum and even a few Joe-Pye-Weed growing along the trail. After the trail crosses a stream, the exotic multiflora rose starts showing up in force, but natives like black cohosh (photo) and broad beech fern still find room to grow. 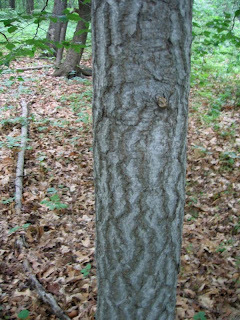 Photo #2: Daniel pointed out a beech tree with very un-beechlike bark (photo). 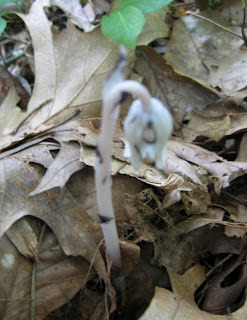 Photo #3: ...and correctly identified Indian Pipe, a parasitic plant related to blueberries. 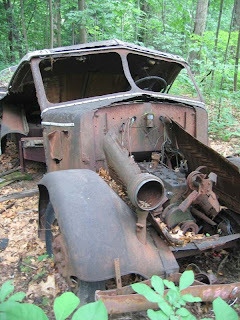 #4: Some would call this old jalopy an eyesore, but I like to think of it as history, a time capsule slowly returning to earth as the trees rise above. Thanks to Suzy of the Whole Earth Center for bringing along cider and pretzels for a post-walk snack.